Not all heart attacks and strokes begin with the sudden, crushing pain you often see on TV or in the movies. Many heart attacks start slowly as mild pain or discomfort. Learn the common warning signs of a heart attack or stroke. Remember, if you think you or someone else is having a heart attack or stroke, act quickly and call 911 immediately and ask to be taken to the ER at St. Joseph's Hospital. A heart attack means the flow of blood to your heart has stopped, usually due to a blockage in your blood vessels. Your heart can't get enough oxygen and the muscle begins to die. Prevent heart attacks by undergoing regular screenings. Chest pain is the most obvious sign of a heart attack. However, it is possible to have a heart attack without any chest pain at all. Be aware of the signs and symptoms of a heart attack so you can seek treatment immediately. The sooner we treat you, the better your chances are for recovery. We can perform emergency cardiac catheterization in our cardiac cath labs to restore your blood flow. Learn more about cardiac catheterization at St. Joseph's. 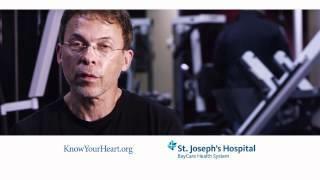 Watch our patient stories to learn why they chose St. Joseph's Hospital when they had a heart attack. Plastic Surgeon, William L. Carter, MD, speaks about how BayCare's St. Joseph's Hospital saved his life after a heart attack. Chest discomfort. It may feel like uncomfortable pressure, squeezing, fullness or pain. The discomfort can be mild or severe, and it may come and go. Discomfort or pain in other areas of the upper body, including one or both arms, the back, neck, jaw or stomach. After a heart attack, we will most likely recommend cardiac rehabilitation to restore your heart's strength and function. A stroke happens when the blood flow to your brain is interrupted. Your brain cells can't get the oxygen and nutrients they need, and they begin to die. Know the symptoms of a stroke and get help immediately if you suspect that you or a loved one is having a stroke. Learn more about stroke care at our Stroke Center. Watch our patient stories to learn why they chose St. Joseph's Hospital when they had a stroke. David S., a patient of St. Joseph's Hospital experienced a stroke and underwent a procedure called IV TPA. 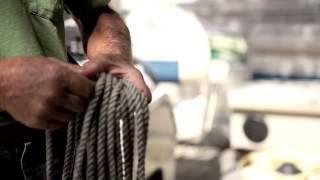 Watch as he shares his story. To find out if you are at risk for heart attack or stroke or for a physician referral, call (813) 644-4322.